Highlights of Rawdanur's upcoming events, ESL classes, Riverside Art Alliance Market and many more. We've had the pleasure to be featured on My Awesome Empire on KCAA, Saturday, February 18, 2017. Our founders, Selin Nielsen and Sherry Mackay, were honored to talk about our organization's upbringing and mission. We've been established for more than a year now and along advocating our refugee families in the area, our ESL classes are the most active. We hope to connect with more families in the Inland Empire and to grow our volunteers and partners. Do you pray for something to happen or for something not to happen? By all of the wrong things happening, Sana’s prayers were answered. Who would want a truck to break down on a freeway somewhere between Moreno Valley and Fresno, California with their entire home packed up in it? Or to be told that the apartment that they would be moving to with their 4 young children wouldn’t be available for another 2 weeks because the previous tenants left a mess and they needed extra time to get the apartment in shape for them? All of this happening when you know that you need to be out of your apartment by the next day! Sana, her husband Ali and their 4 children moved to California from Afghanistan almost a year ago. Her husband was a carpenter who worked with the American military. He was issued a Special Immigrant Visa (SIV). Many such visas were issued because Afghans who supported the U.S. efforts in their country, were targeted by resistance groups. Ali doesn’t have a higher education and doesn’t speak much English; however, he’s very proud of his work with the American military and proudly displays his certificates in carpentry. Like other refugees, this family received bare bones support. Ali desperate for work stood outside of Home Depot trying to pick up odd jobs to pay some bills. His wife sold some baklava (a sweet layered dessert) to friends in the area. They couldn’t pay their rent and were advised by friends in Fresno that it would be more affordable and there was a better chance to find a job. Still, in their hearts, they didn’t want to go. Sana was studying English, their 3 older children were settled into their school, and they had made friends here. I’m her English teacher and I was one of the many people who was very sad to see them leave, but I felt like my hands were tied. On Thursday, our class ended at 11:30 am and we all said goodbye to her. An hour or two after class, I heard about the series of unfortunate events: the truck breaking down, the apartment falling through, and the family potentially becoming homeless the next day. I also heard that they had slept in their empty apartment with no blankets and no heat the night before. That same afternoon, a former student and fellow Afghan said that her husband could probably get Ali a job. With a job in sight, I could start to see that it was possible for them to stay. I started calling around to see who could potentially help. After a number of desperate calls, I finally reached Owaiz Dadabhoy and Dr. Ahmed Almikhtar from Uplift Charity in Anaheim (almost an hour away) and they calmly reassured me that they could probably help this family. They would send a caseworker to visit the family in the morning. I soon found out that there is a huge difference between paying month-to-month and signing a year contract for an apartment--a couple of hundred dollars per month. Who wouldn’t want to pay less for their apartment, but when you’re barely scraping by and you don’t have a steady income coming in, you live month-to-month…..or with this family, day-to-day. Mohammed, the caseworker from Uplift Charity, a refugee himself from Iraq, arrived at their home Friday morning. He assessed their situation and soon helped them sign a one-year lease for their apartment. We heard that the truck loaded with all of their belongings would return in a couple of days. Blankets and food were bought by Uplift Charity and towels and other basics were donated by community members. When I visited the couple that day they were so relieved and so grateful. Sana expressed how happy she was that they weren’t moving to Fresno. When I left them, they were excited to go and pick up their kids at school to tell them and their teachers that they’d be staying. Sana’s prayers were answered. She was staying home. They are still waiting to hear about the job, but, I believe that they feel more confident now that they are connected with so many people in the community. This couple is resilient, capable and hard-working. Why am I saying all this? Sadly, this kind of story isn’t that rare. Many refugees move to the U.S. with the dream of a safe life and opportunities for themselves and their children. However, the reality is that resettlement agencies are overloaded and often can’t even provide the minimal support that is expected of them. Take a minute to imagine yourself moving to a new country where you don’t know the language, you don’t have any contacts, you need to get yourself and your family established, and you need to find a job immediately. I get overwhelmed just thinking about it. It’s great that the U.S. is accepting refugees. We need to continue doing this, but at the same time, we can maybe help make the transition easier. Currently, there is a gap--at least, in the Inland Empire. Fortunately, individuals and organizations are stepping up to fill the void. Students, community members, nonprofits, and faith-based institutions are coming together to support these families as they start their new lives. In the end it was nothing short of a miracle how everything came together. But, if you think about it, it was a collection of small efforts, a few phone calls, the right introductions, and good intentions. I would urge everybody to take a small step, pick up the phone, introduce yourself, and we can make more miracles happen to the people who need it the most. *names have been changed to respect the family’s privacy. There was no Call to Prayer, but for the first time I felt the spirit of Ramadan here in Riverside. Holidays reflect a culture and tell us a lot about those who celebrate it. Eid al-Fitr, is an important religious holiday celebrated by Muslims worldwide to mark the end of Ramadan, the Islamic holy month of fasting. This year I got the opportunity to witness and, to a certain degree, experience the importance it holds for Muslims. Along with many other non-Muslim community members, I shared in the celebration because we were invited to do so. I teach ESL classes twice a week to a group of Afghan women. During the first week of Ramadan they came to class, but they were dragging. The looked tired because they were fasting. They needed to stay up late the night before to eat after sunset and woke up at around 3 in the morning to eat before sunrise. One woman slept through her alarm and hadn’t eaten since the night before. During the second week, I could see that it was difficult to concentrate, but they seemed to be fairing better. To say the least, I was impressed with their dedication and determination to continue the fasting. By the third week, I can only describe their state as Zen. They had found their groove and were very proud of their fasting. There was a newfound camaraderie amongst these women in doing this together. I also learned that this is a time of forgiveness and charity. The women were excited to buy new clothes and to celebrate Eid. They were also going to ensure that all their Muslim brothers and sisters would have food and money to buy new clothes. I was invited to two Iftars: the meal eaten by Muslims after sunset during Ramadan. The Islamic Center of Riverside hosted the first one, which was held on the rooftop of City Hall. 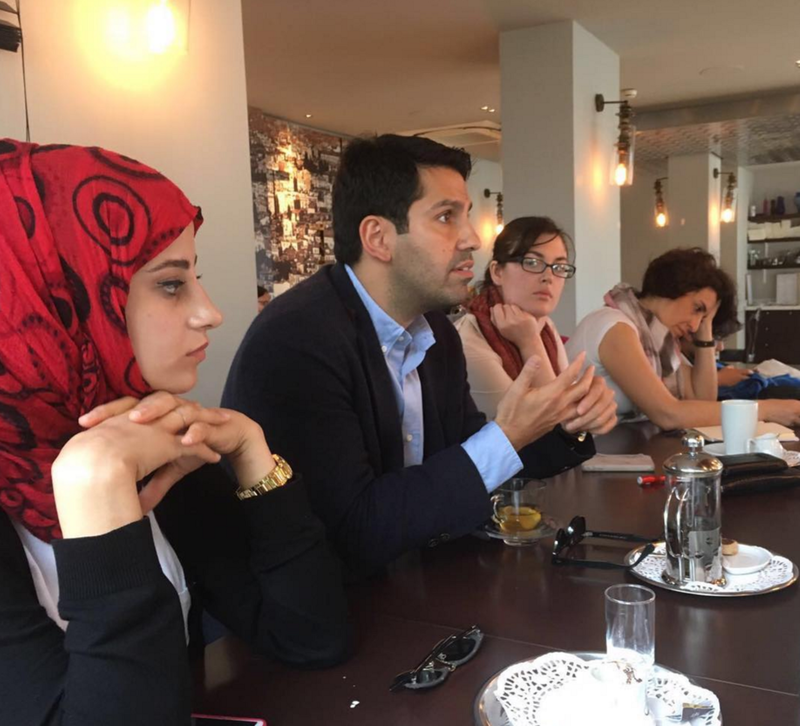 Many officials and representatives from both the Muslim and larger community shared insights and experiences. A calm and embracing energy left me feeling recharged and connected to our Riverside community. The second Iftar was hosted by the Sahaba Initiative--a nonprofit that aims to develop healthy families through social services and community efforts, which include mental health, mentorship and direct services. The event brought together volunteers, nonprofit organizations, civic leaders, clergy, community leaders and businesses, and recognized outstanding service in Riverside and San Bernardino Counties. Once again, I was reminded of how open and welcoming the Muslim community in Riverside is to the larger community. Many civic leaders, such as Mayor Rusty Bailey of Riverside, Mayor Carey Davis of San Bernardino and Congressman Mark Takano shared their well wishes and their commitment to support our Muslim community members. Professor Dr. Yolanda Moses of UCR gave a speech about solidarity and embracing diversity and conflict. Congressman Takano, the son of two Japanese immigrants identified with the feeling of being isolated and shunned upon because of one’s ethnicity. Two non-Muslims shared how they have fasted for years in solidarity of their Muslim friends. Another community member shared how his friend told him that we’re always looking for a stigma to attach to. For example, in the past the AIDs epidemic made so many fearful of the LGBT community. Now, Terrorism makes so many fearful of all Muslims. We were reminded that the horrific acts of violence we have witnessed around the world, in the name of religion, in no way reflects Islam. Recently, as I’ve driven around Riverside, I’ve seen signs on churches and a synagogue that wished Muslims a happy Ramadan season. This community has embraced interfaith connection. I feel great hope for our country because of what I’ve witnessed locally. When people (of any faith) connect and really get to know one another anything is possible. Last Thursday, I had the pleasure of attending my first Ramadan Iftar on behalf of Glocally Connected. It was AWESOME. Both observing and non-observing members of the community gathered in Riverside City Hall to break fast at sunset, and the event’s guest list showcased the city’s commitment to diversity. The Iftar, hosted by the Islamic Center of Riverside, attracted local and state government officials like Senator Richard Roth and Mayor Rusty Bailey, religious leaders like Ibrahim Massoud, and UC Riverside faculty like Vice Chancellor Mariam Lam Named, many of whom shared their sentiments and support toward the Riverside Muslim community. Through this opportunity, Sherry and I communicated the mission of Glocally Connected and identified potential allies and partners, all while being treated to a delicious meal of figs, rice, meat, and vegetables! As the speech-giving progressed, love, peace, and light emerged as key themes along with Riverside’s four pillars (inclusivity, diversity, respect, and pride), challenging the divisions of today’s world. These community leaders had come from all walks of life, religious affiliation, and political orientation, and yet, their speeches harmonized perfectly. They addressed sensitive topics and current events, but refused to submit to fear. They were completely realistic about the challenges ahead, but still chose to renew their commitment to bridging divides. Labels and statuses melted away, leaving behind something remarkably human. Because of this experience, I felt re-energized, and also incredibly excited for the rest of the internship to unfold. The Iftar reminded me of the most valuable service one can provide for another: the opportunity to be seen and to be heard. Most importantly it reminded me that at a time when the world seems to be riddled with division, the best place to start is to meet a new neighbor and share a meal. Here is the article written by Meral Guzel. 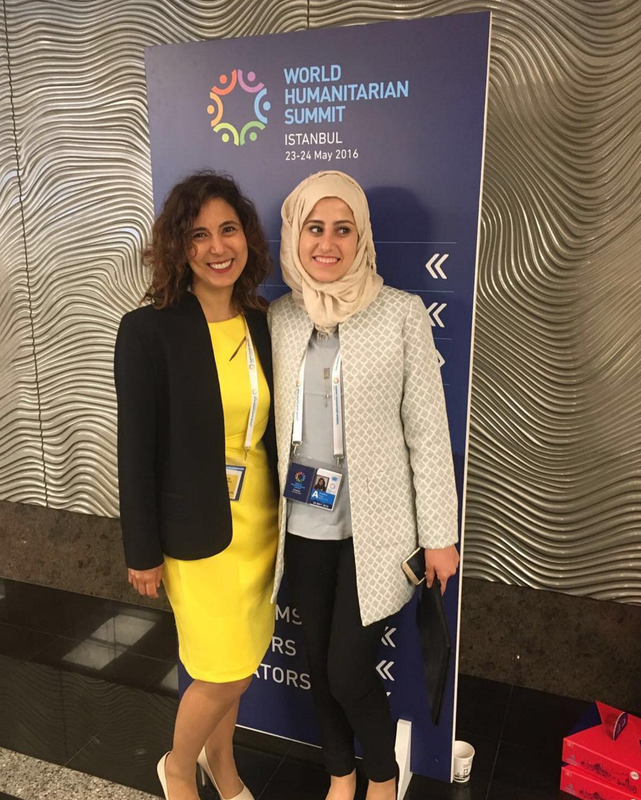 Dr. Selin Yildiz Nielsen and Rawdanur Cuma attended the 2016 World Humanitarian Summit at Istanbul, Turkey. As the name suggests, the ’summit' was ‘all Chiefs, no Indians’ and although there were several pledges made, it was mostly a lot of talk. We will see the action in the coming days, I hope. 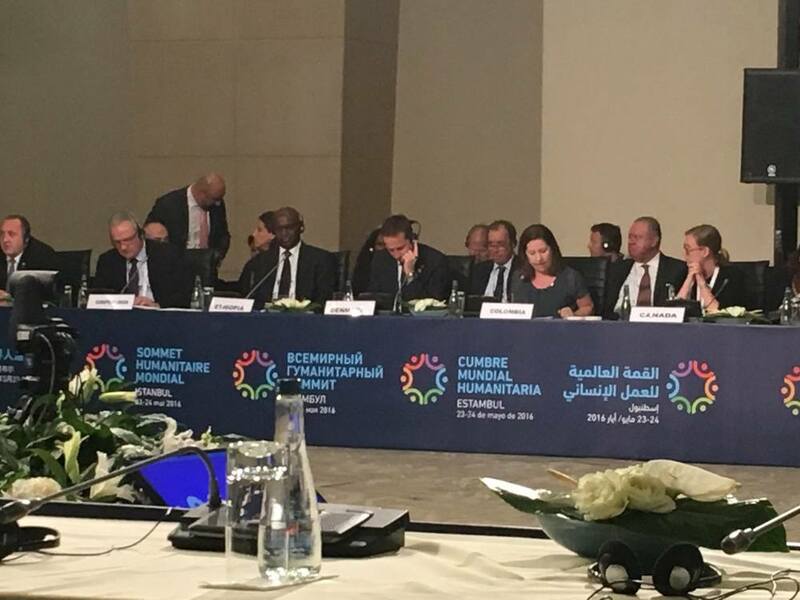 I would have expected to see more refugees, and ordinary people from countries that are in dire situations connecting with the leaders. First of all, it was a huge ordeal to get in the conference. You needed special invitation from the UN, and no more than two people could represent each organization. So the top of the tops were picked to be there. Also, there were side events which us, mere mortals could attend, and that was just the conference side of it. The vetting process was really tight. First you proved that you were in the system, invited and registered from months ago; then after gaining access to the premises, you were checked again in another area with your id and had to provide your letter and papers again. There were about 4 stations you went through to convince people that you are you, and you had access. Inside was a circus of very important people like head of states with large entourages. The more important you are, the larger the crowd of your entourage. Then, there were important people to the Aid World, they usually walked around with some people around them as well. There were Turkish state people, president, ministers, governors, mayors and people from disaster management organizations (Kizilay, AFAD, Red Cross etc. ), large humanitarian organizations, and some NGOs. I heard some conversations among these people I mentioned earlier, and there was a theme. The less important NGOs were trying to get to the heads of more powerful ones, and those were trying to rub elbows with heads of famous organizations and the heads of those organizations were trying to chat with the statesmen. Subject was clear. The tiny ones asking larger ones for money, the larger ones asking the UN or other Humanitarian organizations for money, UN and other Humanitarian organizations asking the governments for money. Governments pledged millions, US and UK leading in the numbers followed by UAE and others, you’ll probably read about them in the news. And then, there was Sean Penn, the celebrity raising awareness on the Aid issue. I can say one of my highlights was meeting him, and of course getting tongue tied, stuttering incomprehensible strain of words when his piercing blue eyes met mine. I am a human, after all. Walking around with Rawdanur, I expected more people to stop us and talk to her. Ask her how she is doing and what she needs, engage in conversation with her, and see in real life what refugees really want. “Please stop the war in my country. I want to live in my own house again, you are a leader, maybe you can help me. I don’t want to be a refugee.” That said it all. Don’t meet in expensive venues discussing how to make band aids, get together to seriously commit to solving the problems. The "Salam Neighbor" movie screening last week turned out great thanks to collaborative effort between our two other sponsors, World Affairs Council of Inland Southern California and UCR's Global Issues Forum. We also had a follow-up talk at UCR with Selin, Sherry and Jared who shared their first hand experiences with #refugees here at home and abroad. We hope that you continue to engage in these sorts of issues that are transpiring globally.